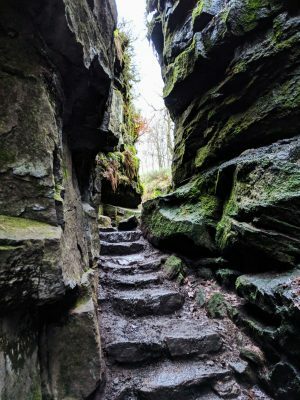 The Peak District is covered with many ancient pathways, stone circles and cave networks, but one of my favourite sites is Lud’s Church, a hidden chasm that can only be reached on foot. This mystical place is surrounded by legend, but it’s most often connected with the medieval Arthurian classic, Sir Gawain and the Green Knight. We’ve completed this journey several times in all weathers, and although there’s a climb to reach the crevice, it’s a fairly easy walk with great views and an otherworldly atmosphere. 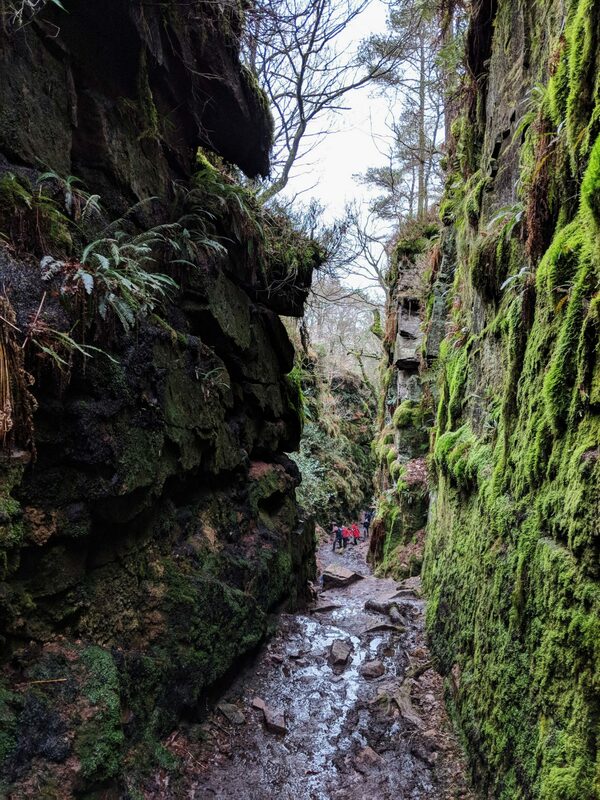 Before you set off on the Lud’s Church walk, it’s worth getting a little acquainted with the tale that inspired this quest. The poem starts when a strange Green Knight visits King Arthur’s court. He allows anyone to strike him with an axe on the condition that after one year, the challenger will receive a return blow. Gawain accepts the challenge, and beheads the knight immediately, who then stands up, picks up his head, and tells Gawain to meet him at the Green Chapel. Gawain agrees and faces many obstacles on the way, which he ultimately overcomes, demonstrating his loyalty and chastity. No one knows the identity of the poet who wrote the verse, but the dialect suggests that he may have come from Staffordshire and that Lud’s Church provided the setting for the mysterious Green Chapel. This area is riddled with amazing walks, but as we have a 6-year-old, we took the easiest and quickest route (2.72 miles/4.4 km including return journey). The Roaches are nearby and can easily be included in a day so I’ve linked to a longer trail at the end of this post. The best place to start from is Gradbach Carpark (SK17 0SU) which is a little way off the A53 between Buxton and Leek. It’s free, but it does fill up fast so try to get there early. Turning right along the road you walk until you reach the sign for Gradbach Mill, which now offers self-catering accommodation (I quite fancy booking this myself!). Although this looks like a private drive, there’s a public footpath running through it so head down past the unusual trough and through the buildings until you reach steps to a gate. It’s hard to believe that when the silk factory was in operation, this hamlet was a busy industrial hub. The next stretch gets really muddy so you’ll need boots. Carry on with the hedge on your right until you reach a bridge crossing the river Dane (don’t take the Scout Camp detours). Walk over to the foot of Back Forest. There’s a sign just past the two huge trees which points to a track that winds right up the hillside. Follow this to the top. Eventually you’ll see a large rocky outcrop to the right, which makes a great picnic spot. It’s also good for kids to scramble on. Don’t stop quite yet though because the Green Chapel is close by. With your back to the stones, search for the wooden signpost ahead. Turn left and continue on the path which snakes for around 200 metres until you reach the concealed entrance on your right. If no one is around, it’s really easy to miss this so keep an eye on the ground as there’s a marker slab to guide you in. Head up the steps then bear right and down to the chasm. On our most recent visit, the ground was extremely boggy. Even though someone has laid planks, it’s still tricky to navigate particularly if you have young children or small dogs. We loved the adventure of it all, but if you’re not into getting muddy then avoid going in wet weather. Once you’re inside the cleft, you can see why Lud’s Church has sparked so many stories. Covered in lichen and moss, it has an air of mystery and magic. The chasm runs for about 100 metres (328 ft) and is 15 metres (49 ft) high in some places The first section is fairly open, but the back section is more intricate, with smaller corridors and crevices to explore – a perfect hiding place. The Lollards, led by Sir Walter de Lud-Auk, were supposed to have worshipped in secret here during the 1400s (read more about this in this post). It’s also reputed that Robin Hood, Friar Tuck and Bonnie Prince Charlie used this as a hideout although there was no chance of disappearing when we were there. Even on a bleak January afternoon, it was pretty busy. Debatande with hymself quat hit be myght. I always struggle to capture the spirit of Lud’s in photos. It has an ecosystem of it’s own so is one of those places that you really need to see for yourself. You can exit via the back of the cave, but we always return via the path we entered on to get the full effect of the space. After this, it’s a downhill walk from Lud’s Church back to the car park, maybe stopping to ascend the gritstone formations and admire the views. As I mentioned at the beginning, this is a relatively simple trek which is suitable for families and fine-weather walkers. It requires a certain level of fitness, but it’s not going to stretch a more ambitious hiker who might prefer this 7 mile circuit that takes you up onto the Roaches. Equipment: The walk to Lud’s Church can be very boggy so wear sturdy boots. The weather is changeable on the tops so take a waterproof jacket and hat (plus gloves in winter). Bring water and snacks for the climb. Food: Gradbach Mill has an Outdoor Cafe that opens between Easter and October (11am to 5pm). We haven’t sampled the food yet. For heartier fare, we’ve heard that The Lazy Trout is good, but you’ll need to book. Nearby Attractions: The Roaches make an excellent natural playground, but if you’re looking for something man-made then try Tittesworth Reservoir (which also has a reasonable cafe). Buxton is only 15 minutes’ drive away and has a cinema, theatre and park. Accommodation: There are plenty of options in Buxton. An affordable family choice is Premier Inn and if you want to go for something more luxurious you could try the Buxton Lee Wood Hotel or Roseleigh. Campers might want to check out Hazel Barrow Farm. We haven’t stayed at any of these so these are suggestions only. If you’ve enjoyed this guide, then you might like to see our other Literary Travel posts. Note that this post includes affiliate links. I’ve done this walk! I had no idea it had so many interesting associations though! I feel as if I’ve only scratched the surface here! Did you enjoy the walk? I think it’s one of those that has a bit of everything! This is now on my list for spring/summer walks. We are only half an hour from Buxton and absolutely love the Peak District. Lovely post. I have to go there one day. I hope you can! You can sense the magic as you climb towards the chasm – it has something very special.